While I know it's started to warm up a little in Scotland, elsewhere such as North America is pretty cold so I thought I'd pull together a little skincare collection of products to use during the cold weather. First off, my skin usually gets very dry so I like to use a rich moisturiser under my makeup. 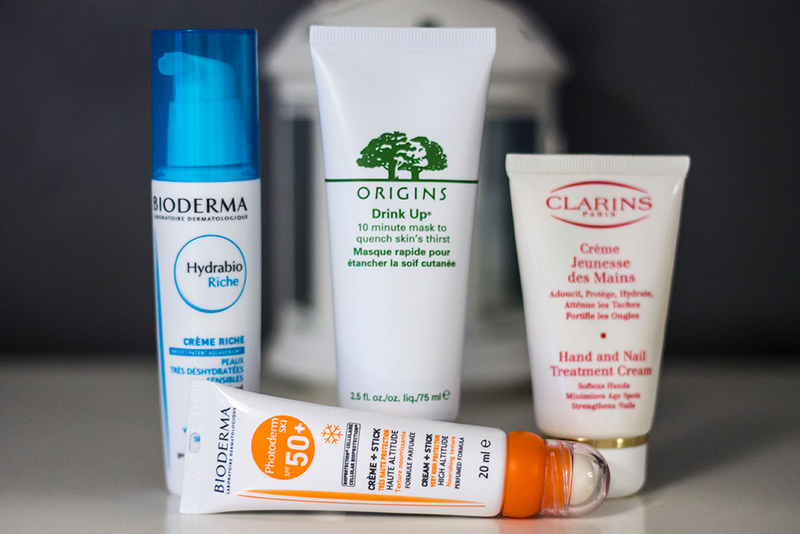 My choice would be the Bioderma Hydrabio Riche Moisturiser as it's for dehydrated skin. While it's rich, it's not at all heavy on the skin but very moisturising and hydrating. Also from Bioderma is their Photoderm Ski SPF 50+* which is basically an SPF for cold weather. As strange as it seems, your skin can get burnt even in cold weather so a really high SPF will be essential in protecting your skin. It also comes with a lip balm attached which is honestly one of the best I've tried and will protect your lips against the cold. Whether it's very cold where you are or you're planning a Ski holiday, definitely pick this up. When I come in from the cold, I love changing into cosy clothes and popping on a hydrating face mask. For a quick boost of hydration I'd recommend the Origins Drink Up 10 Minute Mask. I went into more detail about it on my Origins Masks Marvels post but it completely softens your skin and gives it the hydration it needs. Last but not least, don't forget your hands! My favourite hand cream of all time has to be the Clarins Hand and Nail Treatment Cream. Your hands are one of the first places to show signs of aging so it's important to keep them moisturised. This little hand cream softens hands, minimizes age spots and strengthens nails all in one go. They also often give these away as a free gift with purchase so get your hands on it!